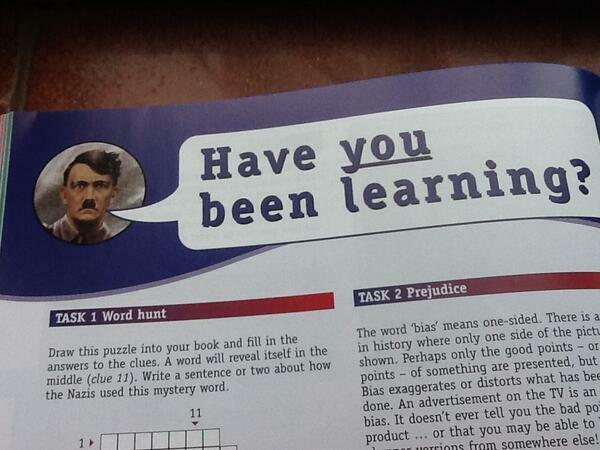 What is wrong with modern history textbooks? 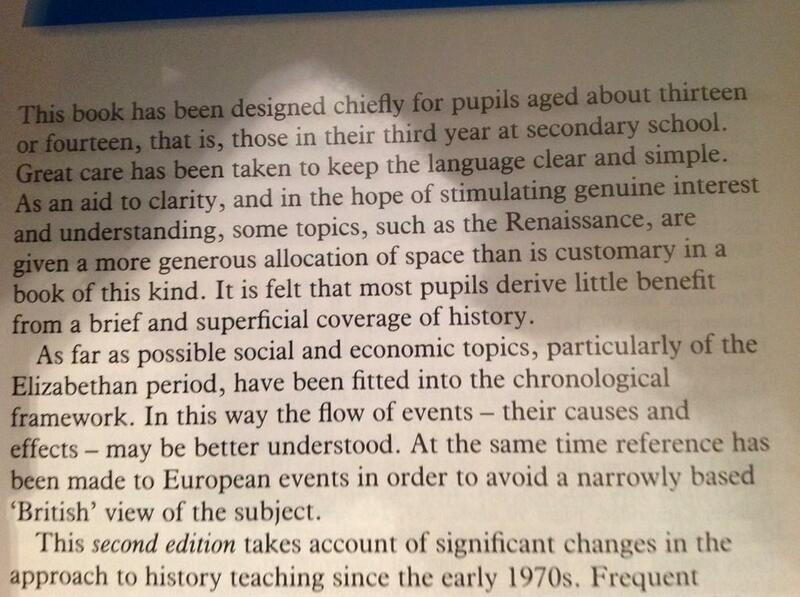 Textbooks are indispensable in secondary history, try teaching A level without them. Students may have one issued to them but teachers tend to have a selection they use when creating their own resources. Learning history, inescapably, means covering lots of content and textbooks are used because they tend to present the content clearly and at the right level. Given how frequently teachers don’t know much about a new topic when they first teach it, textbooks are often used by teachers to find out what the key details are they need to stress when teaching. Match of the Day: England versus Spain. What is wrong with the exercise asking whether Henry VII was a gangster? 1. Relevance is meant to make a topic fun but often fails. How many 12 year olds are engaged by the idea of gangster culture? For all the other children that question has no relevance and may actually make the kid feel more alienated as they can’t get excited by the question. Match of the Day might be relevant to many but since exactly when did all kids love football? I am not against using modern day analogies to help students understand a topic, far from it. However, it is best left to the teacher who knows the class and can judge which analogies will lead to deeper understanding and which will be a distraction. 2. We shouldn’t assume students will find the history itself boring. Generally speaking the children I teach find history interesting – because it is. True, a dull teacher can desiccate the most fascinating detail but they could also drain the life out of a discussion of gangsterism or football . Once the teacher has done their job, whet the appetite of the kids, perhaps that may even have been by using a gangster or football analogy, kids will be thirsty to find out more. The Unstead books mentioned by Robert Peal were purposefully loaded with rich, fascinating detail and that was why they were so popular. 3. Relevance can be a distraction. Of those 12 year olds that find the idea of gangsterism exciting how many really know anything about gangsterism? If you seriously hope to help students towards an answer to that question you will have to spend some time teaching them about gangsterism today so they have a properly understood checklist of features to judge Henry VII against. Not only is it not a great historical question anyway but students who have a very weak notion of what gangsterism REALLY is have to use this imperfect understanding to make judgements of their own on the thing they DO need to understand, Henry VII. There is a strong likelihood the question will be an impediment to understanding. It is also a distraction. It is possible that within a month or two all the students will remember is Miss playing a gangster rap because that was most memorable. 4. The apparent focus on developing analytical skills is fairly illusory. There is a real tendency these days to think we are teaching children ‘to analyse’ when in fact we have simply taught them ‘some analysis’. A child that formerly used to regurgitate a series of events in answer to a question now simply lists a series of factors. These modern textbooks instead of telling the story ‘tell’ the debate. I agree with giving students inquiry questions to answer and will guide them towards a series of points they can use in their answer. However let us not kid ourselves that students that regurgitate lists of factors that modern textbooks tend to supply (in place of narrative) have created their own analysis. 5. The textbook misses out the content essential for analysis. I somehow realised, even if I didn’t articulate it in my mind, that what ACTUALLY allows students to analyse effectively is a detailed understanding of the events. Modern textbooks such as the one discussed often have pitifully little detail and then ask hugely complex questions. If students don’t get the necessary detail from somewhere else the answers that result are often not meaningful analysis but regurgitation or pretty meaningless judgements that just display the students’ (avoidable) ignorance. 6. Textbooks which focus on teaching the analysis make exciting history boring. I am going to have to teach one theme of an A2 thematic course on Russia next term. I have never taught the period and so thought I’d start by looking at the student exam board textbook. It made me want to weep! The students complain they don’t understand Russian history by the end and I can now see why. The textbook is divided up thematically, not chronologically but then each theme is cut up into sub themes to the point where any possible sense of narrative, of interconnections and of period is totally lost. History has been reduced to capsules of ‘content’ compartmentalised to fit the board essay structure. You can get a good grade by learning to slot these fairly meaningless chunks of content into the right parts of the essay jigsaw. Not only is the interesting story lost in textbooks that focus on analysis but without that story you don’t really understand what you are talking about. 7. You have to start with SOMEONE’S story. Nick Dennis has written a really interesting blog criticising Peal’s article. He explains that old fashioned narrative textbooks which give a story exclude other possible interpretations. I absolutely agree that it is important at secondary level to ensure students understand that our stories of the past are interpretations and that they are told about some of the areas of debate among historians. However, as any history teacher knows, we are all biased. Any textbook, in the selection of content it presents, tells certain stories to the exclusion of others. I have sometimes been made to realise how even our most basic explanations of events are loaded full of value judgements, for example when I had to teach Soviet history with a Russian student in the classroom. A modern textbook may try to tell more than one story but even the choice of enquiries featured is laden with value judgements. Perhaps we don’t want Unstead’s stories anymore but we must start with someone’s stories and if we want our students to ever analyse effectively, make those stories rich, laden with fascinating details that draw attention to what is innately interesting, not extraneous distractions.